Like many people growing up in the noughties, watching re-runs of Friends on E4 was my first taste of vicarious aspirational living. Trendy coffee shops, gargantuan apartments and endlessly quirky antics combined to shape a fantasyland of what your twenties could look like. And at the centre of it all was Ross and Rachel, the couple we were led to believe – throughout each poorly defined break-up and every malfunctioning condom – were made for each other. Although it’s been 14 years since she got off the plane, the weighty romantic aspirations of an entire generation lie on the eternally well dressed shoulders of Ross and Rachel. Honestly, in these less idealistic times it would not have surprised me if it turned out Rachel had run away with Ugly Naked Guy leaving Ross to raise an emotionally damaged Emma all alone. Luckily, Friends co-creator David Crane has stepped in and put millennial minds on both sides of the pond at ease. In your opinion, Ross and Rachel, how they doing? Are they still together? Is that sustainable? Yes. Come on, they worked really hard, ten years. 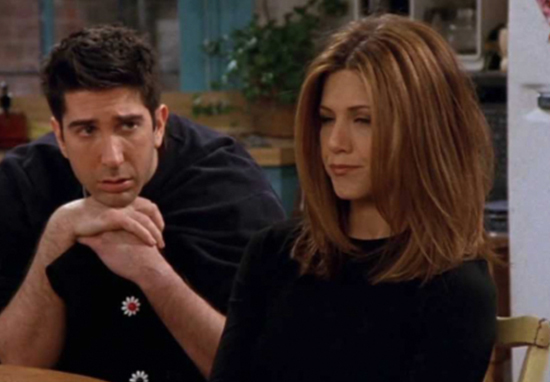 So my sister and I just saw the episode where Ross and Rachel broke up…..seriously?!?! Crane also brought some cheering news about the other iconic – and underrated – couple at the heart of the sitcom, Monica and Chandler, who are reportedly ‘doing just fine too’. No word apparently on Phoebe and Mike or Joey and his long list of conquests. However, I’m sure they’re all doing wonderfully. Friends fans everywhere will no doubt be wondering what the gang are up to nowadays as they navigate middle age. Will Ross have discovered a new dinosaur? Will Monica be the scariest judge on Masterchef? However, sadly our speculations will have to remain in the realm of our imaginations, as there are no plans in the pipeline to resurrect our favourite bunch of New Yorkers. Never happening. Never. We did it! It’s done. That’s why you don’t want to see more of it, because it’s all a happy ending. We are living in an age of reboots and revivals; with everything from Gilmore Girls to The X-Files dusting off their set pieces in an oh-so-cosy way. However, all too often, the reinvigorated show feels all too much like the time traveller it is; mired in nostalgia rather than in cultural relevance. We all want our favourite characters to return but are never fully satisfied when they do. Friends was quintessentially of its time, in an age when you left voicemails rather than a Whatsapp message and straightened, layered hair was the most exciting cut a girl could imagine. No doubt it would be a tempting treat to see Rachel’s on point Instagram page or Chandler’s snarky keyboard warrior-ing, but surely this would risk losing the charm and the innocence of the original run.